Sonya Williams. 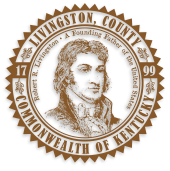 Livingston County Clerk pursuant to KRS 424.130, announces that the 2015 Delinquent Real Property Tax Bills (Certificates of Delinquency) will be published in the Livingston Ledger on Thursday, July 14, 2016. The list of ►Certificates of Delinquency is also available for public inspection during the hours of 8:00am-5:00pm on Mondays, and 8:00am-4:00pm Tuesdays-Fridays at the County Clerk's office located at 321 Court Street Smithland, Kentucky. This list may also be inspected on the website. The Uniform Resource Locator (URL) of the website is http://kydtax.smllc.us/ The tax sale will be held on Friday, August 12, 2016 beginning at 10:00am. All interested participants must register with the County Clerk's office by the close of business on Tuesday, August 2, 2016. Please contact the County Clerk's office if you need additional information about the tax sale registration process, the required registration fee, or the deposit amounts that will be needed. Tax payers can continue to pay their delinquent tax bills to the County Clerk's office any time prior to the tax sale. Please note: All payments must be received in the County Clerk's office prior to the tax sale date listed in this advertisement. Payments received after the tax sale has been conducted will be returned without exception. Some delinquencies - although they have been advertised - will be excluded from the tax sale in accordance with the provisions of KRS 134.504(10)(b). If you have any questions, please do not hesitate to contact the County Clerk's office at 270-928-2162.
please contact the Circuit Court Clerk's Office by clicking here.